Trader Joe's did it. Oakhurst Dairy did it. So why couldn't I? It seemed like chocolate-flavored eggnog was showing up in various places. This moved me to give a cheesecake with eggnog and chocolate layers a try. This mid-December 2012 effort would be my first new cheesecake flavor variety in nearly a year. I used Hood eggnog here. Place resulting mixture in 9 1/2" (or 9") pan. Chill at least until firm, perhaps about 30 minutes minimum. Pour this batter on top of the crust, no higher than halfway from the crust's surface to the top of the pan (if there is any excess batter, use it to make "cupcakes", baking these at 300 degrees for 50 minutes using a bath arrangement). Wrap pan in foil and place in tub—filled only about halfway, or about half an inch, with boiling water. Bake all this at 325 degrees for about 60 minutes. Then take the whole pan-and-tub setup out of the oven, and carefully get it to a comfortable place. Promptly add the chocolate batter as indicated below. Carefully scoop this on top of the eggnog batter and return the pan-and-tub setup to oven, this time at only 300 degrees, and add more hot water to the tub (at this point, go ahead and fill it all the way). Bake for about 120 more minutes. Turn oven off, leaving cheesecake in it (still in tub as well), with the door slightly ajar, for another 60 minutes. 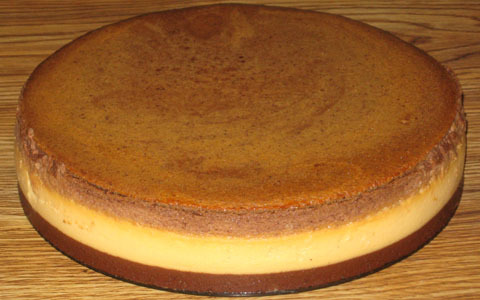 Remove cheesecake from oven and tub and let cool in its pan at room temperature for another 120 minutes. Yes, the cooking times were rather long, due largely to my zeal to get the eggnog batter firm enough. But I wondered about overbaking the chocolate batter in the process. Its top surface seemed to be fairly dry. All that arrowroot and extra baking for the eggnog batter paid off. After a number of past efforts that resulted in this layer coming out too soft in my eggnog pumpkin combinations, this chocolate combo ended up with a reasonably firm eggnog batter layer (which seemed to be even more firm than its chocolate counterpart). This would be a helpful lesson for future cheesecakes involving eggnog, whether alone or in conjunction with a layer of another flavor. Due to the combination of eggnog and chocolate still being in what I felt to be its "infantile" phases, I did not have very high expectations for this prototype at a Living Hope Church lunch—which also featured many other sweets for the Christmas holiday season. 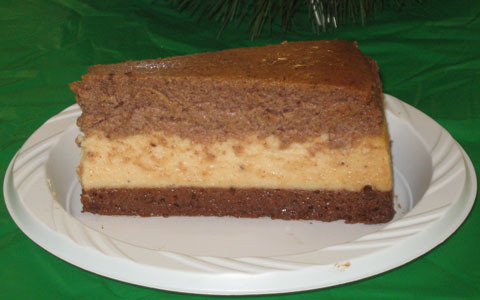 This chocolate-eggnog cheesecake fared quite well anyway—hardly any leftovers! The taste seemed, at least to me, to be reasonably balanced between the chocolate and eggnog, without one flavor overwhelming the other.